In general Filipinos love dishes that are sour or with a hint of it. The sourness of flavours in our dishes makes you feel that what you’re eating is light, and that helps specially knowing some of the known Filipino dishes are oily or contains large chunks of meats. The sour taste cleanses you palate as you eat which in effect does not leave any trail or evidence of what you had just swallowed only that tangy sour feeling. This is why Siningang dishes will always top the list a Filipinos favourite food, its sour, it’s warming, it’s so good with rice. We also love vinegar as a dip in grilled meats or even snacks like chicharon, even our most of our salads have that sour note like eggplant salad and ensaladang mangga. So for this post we will be making some roast chicken designed for the Filipino palate, a lemon and thyme flavoured roast. I love a hint of sour so this recipe sounds like heaven to me, but Himself is not a fan in any way shape or form. He struggles with even the humble lemon. This restricts my options but I do sneak in sweet/sour or something with sour into our menu occasionally. What a wonderful take on roast chicken portions – so tasty especially with the lemon zest too. Simply oozing with taste, like that lovely light browning of the chicken. Simple, clean flavors, always good with chicken. I agree, it does give the impression of a light meal. I would’ve guessed, if asked, a different nationality for that dish. Not sure which one. So once again you’ve taught me something! I love the use of lemon in the dish. Looks just wonderful. Wonderfully simple and fresh flavors!!! Looks awesome. Thanks for sharing. looks attractive and i wanna taste this dish !!! I do love sour flavor in dishes, and I DEFINITELY love thyme! My husband makes an eggplant salad (a bit different than yours) which I only like if he goes really easy on the vinegar. Interesting, got to try out that Sarma. Thanks for the heads up. 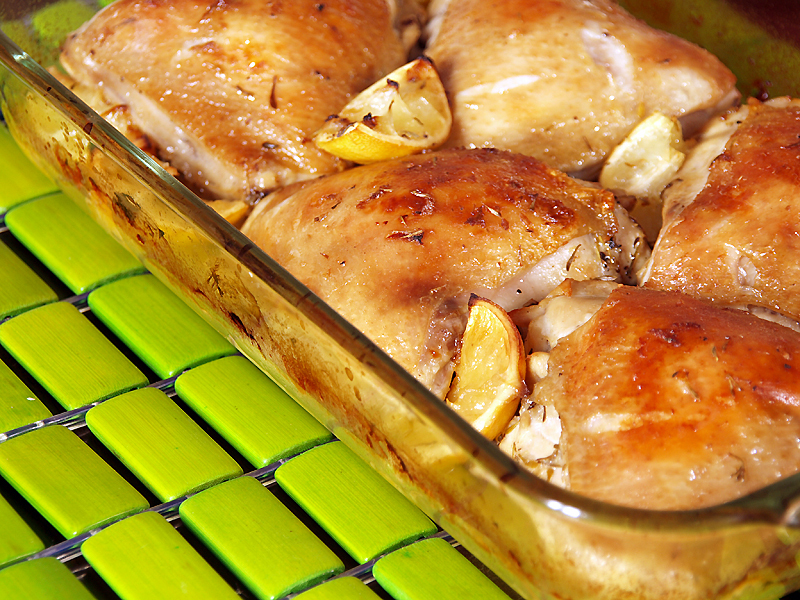 This roast lemon and thyme chicken looks absolutely delicious. I love new chicken recipes that I can make. As I get older I appreciate the sour taste more and more… I must say love it especially in desserts and alcohol cocktails, but this chicken looks like something I might really enjoy!